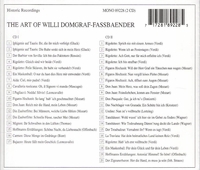 “In 1922 DOMGRAF-FASSBÄNDER made his début in Aachen as Count Almaviva in LE NOZZE DI FIGARO. In the following year, Leo Blech engaged him to the Deutsche Oper Berlin where the young singer continued his vocal studies with Paul Bruns. Due to strong competition, Domgraf-Fassbänder changed to the opera house in Düsseldorf, completing his studies with Giuseppe Borgatti in Milan. It was in Düsseldorf where he gained experience in an extensive repertoire. In 1927 he joined the company of the State Opera in Stuttgart, where he became one of its most popular singers. It was Richard Tauber (his partner in LA BOHÈME and CARMEN) who recommended him to go back to Berlin. General manager Heinz Tietjen, who was to become his mentor, contracted him to the Berlin State Opera, where hegained quickly a reputation as ‘the Italian baritone’. His beautiful voice was of an individual timbre, combined with a superb legato technique, and supported by a remarkable breath control."